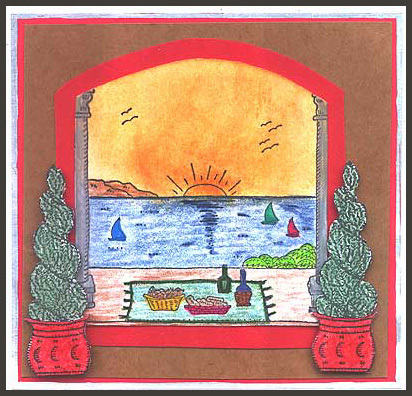 “Sunset Picnic with Border” is stamped on white card stock, colored with oil color pencils and cut out discarding the top and sides of the frame. This is layered over a red piece of paper cut about 1/4″ larger to form a border and is layered on brown parchment card stock and red card stock which has been edged with a Krylon silver Leafing pen. “Rosemary Topiary” is stamped twice on white card stock, colored with oil color pencils, cut out and foam mounted on both sides of the scene. Card by Davetta Alexander.